“I had 50 white people in my house for dinner who I didn’t know,” says Ayana Smith, the creator of #AskMeTees, laughing, as she recounts the night that started the launch of her conversation-starting T-shirt line. We’re chatting on the phone while Smith drives to her day job at the Escape Lounge on H Street in Washington, D.C., a business she owns with her husband, U.S. Air Force Major Timothy Smith. Ayana Smith’s goal with her new line of statement tees was not to make a statement at all but, rather, to issue a call to action, to incite and inspire conversation on topics that can be hard to talk about in mixed company. Looking back on the dinner and her chosen topic, Smith tells me, “We never even got to the topic.” The people who showed up were predominantly white, and Smith says she was shocked by how much they cared and wanted to talk about issues that affect the black community. After that first gathering in July, she began having regular #AskMe group dinners to further the dialogue. The resulting conversations prompted the concept for the tees. 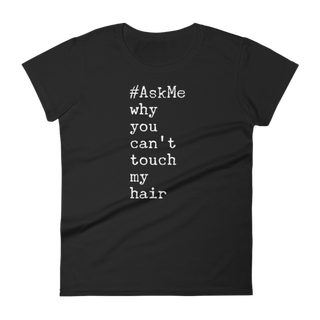 That’s the impetus behind the “#AskMe Why You Can’t Touch My Hair” shirt. “Living while black” was another motivator for launching this T-shirt line—only 10 days old as of press time. For instance, Smith hates rings and doesn’t wear a wedding ring. Because of that, “people assume that my kids don’t have a father.” Yet, to the contrary, they have two excellent and deeply involved parents. “I think people are often afraid to be on the wrong side of an issue, and so they stay quiet around family and colleagues, but the conversations people might possibly have with strangers can be a lot more candid,” she says. An entrepreneur at heart—Smith is currently developing an app for an in-home play version of the Escape Lounge—and a member of Black Female Founders, she printed the words “#AskMe About My Start-Up” to encourage entrepreneurs to practice their pitch as much as possible. That said, Smith doesn’t expect open congress to break out on the streets for everyone wearing one of her tees. But she’s hoping that if you catch the right conversation on the right day, the messages will plant a seed and bear the fruit of healthy, respectful debate—and maybe even sprout a money tree.